A plant develops dying leaves if it isn't getting the nutrients it needs to thrive. This may mean the soil needs to be amended, the plant needs more or less sunlight, its watering needs aren't being met or fertilization is required. The first step to solving the problem is determining what is wrong with the plant. From there, you can make changes to take care of the plant and help it live a long life. Remove dying leaves. Cut or pull them off where they meet healthy foliage. Even though they are dying, they are still stealing nutrients from the rest of the plant. 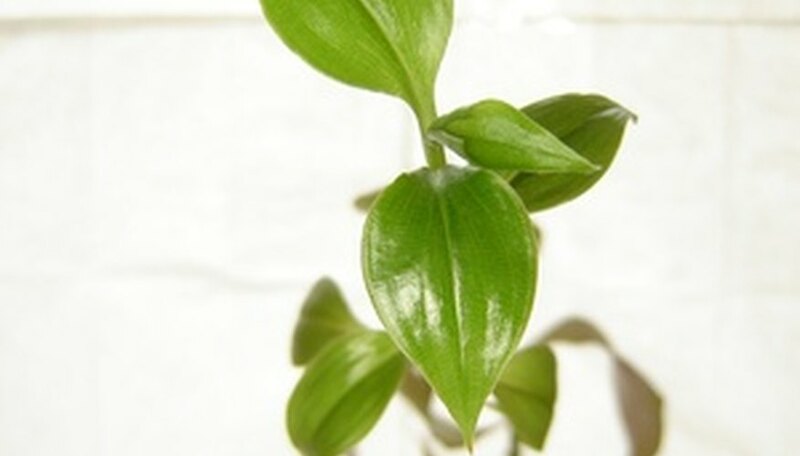 Remove a dying houseplant from its container and check the roots. If they are tightly bound and compacted, they are not growing sufficiently. Transplant it to a larger pot so it can spread out. Use a liquid, granular or slow-release fertilizer. Water-soluble products are better than dilute fertilizers because the dilute form can burn the plant. Follow the instructions on the label. Look for a white film on the soil surface. This indicates salt buildup, caused by either over watering or over fertilizing. Salt buildup damages the roots and turns the leaves brown. Water the plant thoroughly, allowing the water to drain out of the holes in the container. This will flush the salt out of the soil. Check the sunlight requirement for the plant. Too little or too much light will cause dying leaves. Gradually move the plant into an area that gets sufficient light. Water house plants only when the the bottom two thirds of the soil is dry. This is where the roots are located. Insert your finger deep into the soil and add water only when it feels slightly dry. Water until it comes out the drainage holes. Replace the soil with a more porous mix if it's too compacted. You can test this by inserting your finger 2 inches down. Compacted soil prevents the roots from spreading, which causes dying leaves.